Originally released on March 25, 2002, this grouping assembles all variations of the "Rock in Rio" live album and its video counterparts. Rock In Rio is a live album by British heavy metal band Iron Maiden, recorded at Rock in Rio, Brazil in 2001 on the last night of the Brave New World Tour. The band played in front of the second largest crowd of their career, approximately 250,000 people (the band's largest concert attendance was their 1985 Rock In Rio performance to a crowd of 300,000) and with the relatively recent return of lead singer Bruce Dickinson and guitarist Adrian Smith to the band, they recorded their fifth live release. It features many of their most well-known tracks, including the eponymous "Iron Maiden" and "Run to the Hills," along with six songs from Brave New World, such as "The Wicker Man" and the title track. Also performed were two tracks from the Blaze Bayley-era, "Sign of the Cross" and "The Clansman." Rock in Rio is a double live DVD set (also available on VHS & UMD) by the heavy metal band, Iron Maiden. 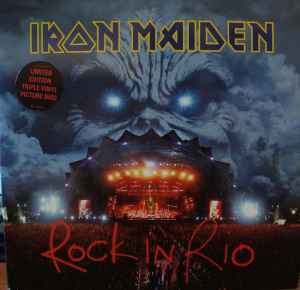 Besides showing the entire performance of the Rock in Rio show, the second disc also includes three special features with interviews with band members, a short documentary on the day in the life of Iron Maiden, and photos by official photographer, Ross Halfin. It claimed the number one slot on the US Soundscan Music DVD Charts in its first week of release, while gaining number two on the Soundscan Music Video Charts. The performance featured at least one song from every Iron Maiden album released to this point apart from 1986's Somewhere in Time and 1990's No Prayer for the Dying. The DVD was released worldwide by EMI on 10 June 2002, and in the U.S. by Columbia Music Video. It was the final show on the band's 2000-2001 tour in support of the Brave New World album. Is this a 3 x LP 180g Set or Not? One of my favorite live albums! This release sounds amazing!! Does anybody know about a re release on black vinyl ? Great to look at. But poor sound quality. After the return of Bruce Dickinson and Adrian Smith to the band and after the Brave New World album, Iron Maiden gave the Brazillian fans a great gift: the greatest Iron Maiden live album. Recorded in Rock in Rio III in Rio de Janeiro, in 2001, Rock in Rio is the first live album with their definite line-up. The album was released in 2002, beginning a year of many surprises to the Iron Maiden fans.